A. Rey Pamatmat's "Edith Can Shoot Things and Hit Them" has only three characters: Twelve-year-old Edith, her sixteen-year-old brother Kenny, and Benji, a boy from school that Kenny is beginning to explore a relationship with. But the echoes of the people not there are huge. As this look at latch-key children unspools, we keep wondering where Edith's and Kenny's parents are, what's the deal with Dad's new girlfriend, the one he spends all his time with, and what kind of mother would turn on adorable Benji just because he's gay. These people are supposed to be adults. They're supposed to be in charge so the kids don't have to. But when push comes to shove, they're just not there. That's why the play feels so real and so emotionally involving, because all three children are sweet and funny in individual ways, they're trying so hard, and they're also incredibly vulnerable. It's scary that they are so much alone, so much responsible for themselves in ways they shouldn't have to be. I was ready to jump in and volunteer to adopt all three, and I knew full well they were fictional. Plus, of course, that title hangs over the play like a threat, building the tension to a bang-up Act I curtain. 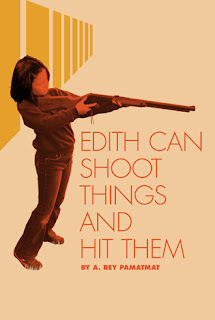 Yes, Edith can and does shoot things and hit them. And so does A. Rey Pamatmat. By giving us these three terrific kids and then setting them adrift, moving the story and the characters in unexpected and compelling ways, Pamatmat hits his dramatic target right in the heart. I found myself moved by the story he told and bereft that I don't get to find out what happens in the future. Does Dad ever see the terrible error of his ways and come in from the cold? Do Kenny and Edith get to stay together now that more people know they have no parental control on that remote farm? Can they at least move off the damn farm? And will Kenny and Benji grow up and find other lovers once they move past this heady case of first love? I saw "Edith Can Shoot Things and Hit Them" a week ago, and I'm still not over it. That, to me, is the mark of the best plays, and the best productions of those plays, if I'm still wallowing in the emotional experience, still feeling wounded and connected, days and weeks after I left it behind. A lot of that is due to May Andrales's sensitive, fine-tuned direction of the Humana production, but also to the terrific performances of Teresa Avia Lim as Edith, John Norman Schneider as Kenny, and Cory Michael Smith as Benji. It's no mean feat for adult actors to make teen (and pre-teen) characters come alive this way. I'm sure all three actors are at least in their twenties, and yet, I still want to adopt them. It's hard to guess where "Edith" will go from here, but I hope there's a way to take this cast with the show to other venues. The challenge of reproducing this production elsewhere makes the Humana production that much more special, given the quality of the actors and technical support, from Brian Sidney-Bembridge's set, based on hay bales and a dumpy sofa, to Jeff Nellis's sharp lighting design and Benjamin Marcum's excellent sound design. Let's hope somebody out there is up to the task so I can revisit "Edith" soon.